AstraZeneca has won approval for its antithrombotic drug ticagrelor (Brilinta) in China, an increasingly important market for the British pharmaceuticals group. Ticagrelor is a platelet aggregation inhibitor that is indicated for the prevention of thrombotic events (for example stroke or heart attack) in patients with acute coronary syndrome or myocardial infarction with ST elevation. China's State Food and Drug Administration has issued an drug import licence for the product, meaning it will now be available for treating patients with acute coronary syndrome in the country, the company said on Thursday. 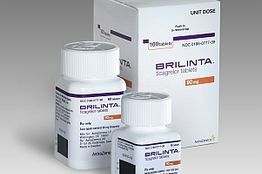 Brilinta has proved better than the cheaper generic medicine clopidogrel in preventing the recurrence of heart attacks, but its sales to date in markets around the world have been disappointing. Revitalising the product is an early priority for new Chief Executive Pascal Soriot, who said last month that Brilinta could do "far better".